The Cheetah Girls have sold over four million combined of their pop releases and both of their Disney Channel movies have garnered audiences each over 19 million. 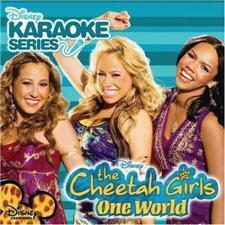 Their Disney Karaoke Series releases Cheetah Girls (February 3, 2004) and Cheetah Girls 2 October 10, 2006) have sold a combined 390,000 since they were released. This karaoke release features songs from the soundtrack to the movie Cheetah Girls: One World which was released Auguest 19, 2008. It contains instrumental and vocal versions of eight tracks plus CD+G and a lyric book.